Knitted with 2 color yarns in the semi-open novelty stitch, the easy fitting bateau has an intriguing two-tone surface. The single color trim placed at the neckline, shoulder lines, and bottom hem frames the sweater with extra personality. 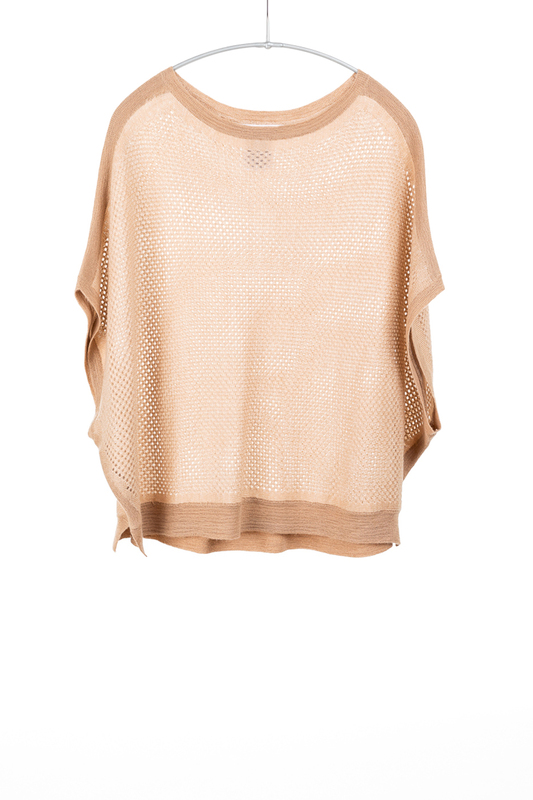 The rectangle shape with big armhole opening creates a beautiful drape and adds comfort while covering the upper arms. Wear it alone, or layer with a cami, a tee, or a white shirt. XS/S: Body Length is 21 3/4”; Chest is 55 1/2”. S/M: Body Length is 22 1/4”; Chest is 58”. M/L: Body Length is 23 1/4”; Chest is 61 1/2”. 2/48’s. 2 ply. 12 gauge.